Why James has been attacked – and why he was called to Paris in the first place – Lydia has no idea. But she knows that she must find out, and quickly. For with James wavering between life and death, and war descending on the world, their slim chance of saving themselves from the vampires grows slimmer with each passing day . . . 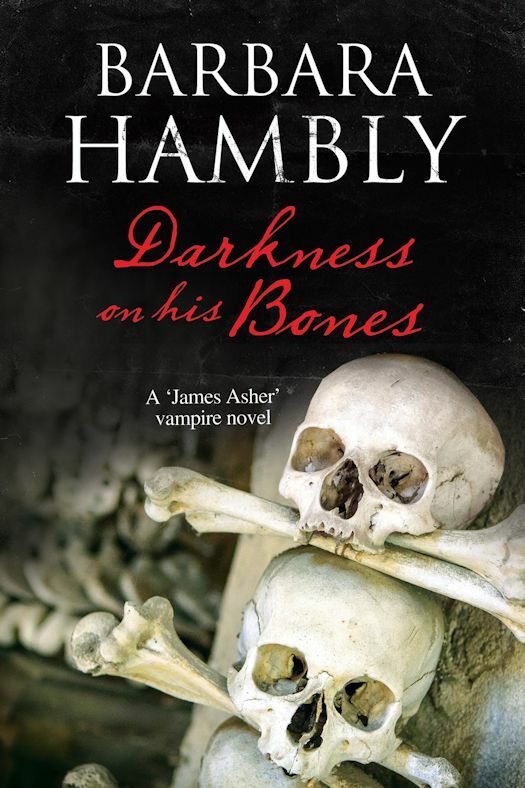 In the late 1980s, I read two books by Barbara Hambly about James Asher*, a professor who also doubles as an English agent; his wife Lydia; and the vampire Don Simon Ysidro. The books were fast-paced and more realistic than many vampire books of that time. These vampires were never glamorized, but they were almost more human than many of the other characters in the books. I loved Hambly’s language and her ability to describe the politics and history of the early 20th century. Imagine my surprise and joy when I discovered not one, but four more novels written about the same characters and the same period! I quickly devoured the next three and was able to finally snag an early copy of this one from the publisher (via NetGalley). Hambly writes just as well, if not better, than I remember from the late 80s. Her language is lyrical, almost poetic at times, and she uses unusual, sometimes archaic words, which match the century which she is describing. It is obvious that she has thoroughly researched the Paris that she describes of both pre-WWI and the 1600s. I could almost picture walking through the churchyard and down in the underground. In this novel, Lydia has been notified that her husband, supposedly at a folklore conference, has been found unconscious and drained of blood in Paris. Despite concerns about a war erupting between France and Germany, Lydia travels to Paris to care for her husband and contacts their somewhat friend, Don Simon. As Paris begins sending men and supplies to the front, Lydia and Don Simon must protect James from the Paris vampires, who appear to have splintered into at least two factions. While Lydia and James deeply love one another, it is obvious from these novels that there is a romantic attachment between Lydia and Don Simon. In several books, he has “declared” himself at her disposal, even unto true death. The fact that a vampire, who has killed hundreds of humans to prolong his life, is capable of such deep feeling is unusual, especially among the vampires themselves. What is interesting is the fact that Lydia, in some fashion, returns such feelings, despite knowing of his horrific crimes and despite still thoroughly loving her husband. Hambly’s characters have always been truly human, with foibles and problems just like we readers have. Her descriptions are ornate and detailed, almost to the point where a reader could draw out the path that her characters follow. Not only that, she is able to set a mood for Paris herself – first jubilant as every man joins the army to defeat the Kaiser and then terrified as the wounded stream back home and the city prepares for attack. This is how I have always loved to learn about history – from stories such as these. I love Darkness on his Bones and can only recommend the entire series to everyone. Hambly was my favorite author in the 1980s, and she is rapidly becoming one of my favorite authors today.